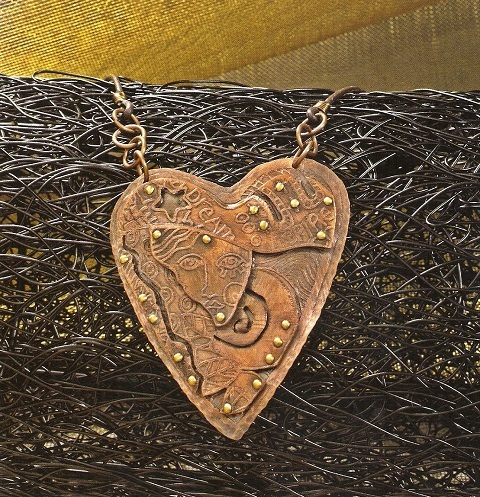 Kim St Jean is a well known metal smith with a gift for teaching. 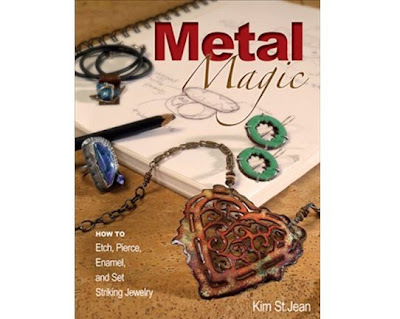 Her previous book Mixed Metal Mania was exceptionally good as she covered wire, soldering, riveting and hammering techniques in such a way that the inexperienced would be encouraged to try and learn. The book is packed with loads of tips. Her latest publication, Metal Magic is a continuation of her inimitable instructional style, this time focusing on etching, piercing, enamel and setting techniques in 30 original designs. One really good section from the first book reappears here slightly expanded and that is "Kim's unconventional tools, tips and tricks". It's well worth a read because these are really useful tips and tricks. For example, using a heat gun to create heat patina if one doesn't have a torch. The front section of this book covers the basics of her latest set of chosen techniques including some she covered before like soldering which is again used in her new batch of designs. Kim is another artisan who also enamels with a torch as well as with a kiln. She includes so many helpful explanations like how to saw properly and why sometimes it is necessary to saw rather than use metal shears. Kim also makes a good case for learning how to solder! One of my favorite designs is her Pugnacious ring shown below which involves the soldering of 5 lengths of wire with balled ends. The unsoldered parts become the prongs. It's hard to believe this design came about by accident and during a class. She was trying to teach her students how to make the Adjustable Ring design from her first book and flubbed the measurements. She then turned the mistake around into an awesome ring! Kim's book is just brimming with ideas for readers to try. 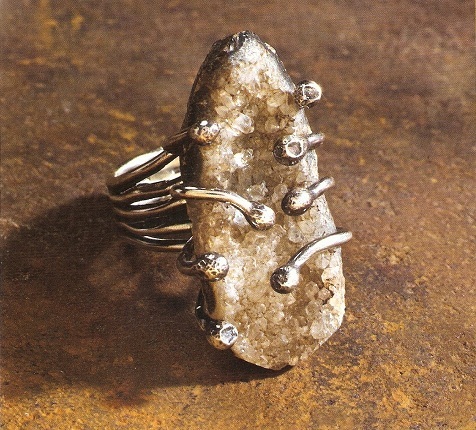 One of the coolest ones is illustrated by her Salt Rocks ring below. This rather organic design is really created using rock salt. The sterling silver scraps are melted and poured onto rock salt. The silver-salt nugget is then placed in a container of water to dissolve the salt. She soldered the prong setting and the ring shank to the rugged remainder. How neat is that? I learned lots for her book and can definitely recommended to intermediate to advanced readers. You don't have to but I think it is worth getting both Mixed Metal Mania as well as this book if you are interested in learning metal work. Check here for a peek into her book. Which Disc Cutter to Get for Jewelry Making? Looks like a great book. I enjoyed the review. If you happen to live in a city with an art college or an artisan guild, you can sometimes rent equipment (like a rolling press); as well as space.